Deep Value is a quantitative investing strategy which selects for investment the cheapest stocks in the universe based on a valuation multiple. The Deep Value Screeners are a great tool to source investment ideas. Investors who perform their own fundamental analysis manually will find there the cheapest stocks trading on the NYSE. The ability to filter and rank stocks may help investors to find exactly what they are looking for. However, the Deep Value Screeners also enable investors to create a Quantitative Deep Value portfolio. All is needed is filtering and sorting the screener list according to the guidelines below, but the top stocks, and rebalance yearly. Follow the guidelines below to construct your own Deep Value portfolio using the Deep Value Strategy Screeners. Select which screener to use. We have two screeners: 2) based on EV/EBIT multiple 3) based on a composite of seven multiples named VC2 (Value Composite 2). Set the 3Y Beta Rank Slider. Lower ranks correspond to lower 3Y Beta. Research shows that lower beta reduces volatility and result in higher returns. Use the guidelines below to examine the historical results for portfolios with beta ranks of 0-100 and 0-50. Set the Volatility Rank Slider. Lower ranks correspond to lower volatility. Research shows that lower volatility results in higher risk-adjusted returns. Use the guidelines below to examine the historical results for portfolios with volatility ranks of 0-100 and 0-50. Sort the stocks of the Quantitative Value Screener based on the Cheapness Rank (a lower rank is better, and corresponds to a cheaper stock). Buy the top stocks on the list. Every rebalance period apply the screening rules described above. We recommend one year for most investors and six months for aggressive investors operating in tax-delayed or tax-exempt accounts. First, you will have to choose which stocks to dispose of. There are two options: Simple Sell Rules; and Low Turnover Sell Rules. See the guidelines below for performance and how to choose. Follow the buy rules above to establish the list of stocks you would like to own had you started a portfolio today. Keep the stock holdings which appear on the list. Sell the stocks which do not appear on the list. Buy the stocks which appear on the list which you do not own yet. Make sure that the All Sliders are wide open and not restricted. Sort the table according to the Cheapness Rank Slider. Lower Ranks (cheaper stocks) should be on the top of the list. Set the Cheapness Rank to 0-25. This will keep in the list only the stocks which are in the 25 percentile of cheap stocks in the universe. Sell the stocks which a Cheapness Rank above the threshold you established. Those stocks will not appear in the screener results table. Set the Market Cap Slider according to your preferences. Follow the buy Rules above to establish the list of stocks you would like to own had you started a portfolio today. Buy the top stocks on the list to replace the ones you had sold. In this section, we describe the performance of Deep Value portfolios using various stock selection criteria and market cap restrictions. A performance comparison between Deep Value and Quantitative Value strategies is definitely of interest, yet out of scope. Quantitative portfolios based on either TEV/EBIT or VC2 (Value Composite 2) perform well, as evident in the backtesting performance table above. There is no clear winner. The portfolio with the highest average annual returns in #3, a VC2-based portfolio. The portfolio with the lowest volatility (as measured by standard deviation) is #16, a TEV/EBIT-based portfolio. The portfolio with the highest risk-adjusted returns (as measured by the Sharpe ratio) is #20, also a TEV/EBIT-based portfolio. Therefore, an investor should establish first his or her goal, highest return potential, lowest volatility or a balance between return and volatility, and choose the screener to use accordingly. Low Size is one of the well-researched stock factors (a.k.a anomaly, or smart beta factor). Small stocks usually outperform larger ones. Individual investors thus have a systematic advantage, as they can invest in small-cap stocks, whereas institutional investors cannot. One of the biggest advantages of investing on your own, rather than buying a mutual fund or an ETF, is the ability to tap into the small-cap space, where opportunities are more abundant. Indeed, the Deep Value portfolio with the highest returns is portfolio #3, an all-cap portfolio with holdings starting from $30M market cap and up. The portfolio with the highest Sharpe is #20, with holdings starting from a $200M market cap. Small-cap stocks usually have higher volatility. Investors wary of volatility will restrict their holdings to mid-cap and large-cap stocks. Deep Value portfolios tend to be very volatile. All the portfolios listed in the table above experience standard deviation of monthly returns above 15%. Some even exceed 20%. For comparison, the standard deviation of monthly returns of the S&P 500 during the same period is a mere 14.37%. A way to reduce volatility is selecting stocks with a low Beta figure. Another way to reduce volatility is simply selecting stocks with low historical volatility. The Beta Rank Slider and Volatility Rank Slider were designed especially for that. Using those sliders, investors can restrict the stock selections to the ones with low beta or the ones with low historical volatility or both. We show results for portfolios constructed from stocks with Beta Ranks range of 0-50 and portfolios with stocks with Volatility Ranks range of 0-50. Let’s compare two portfolios. The first is a TEV/EBIT-based portfolio with holdings of a $200M market cap or higher, with Beta ranks and Volatility ranks unrestricted. Such a portfolio is portfolio #18. It resulted in 15.65% per year on average during the 19 years tested. Its volatility was 20.15%. Now we limit the Volatility Rank range to 0-50. Such a portfolio is portfolio #20. It resulted in a lower performance, but not by much, 16.03 per year, on average. However, its volatility is much improved, at 15.75%, almost 5% better than without limiting the volatility ranks. The risk-adjusted returns, as measured by the Sharpe ratio is thus improved, 0.92 for the low-volatility portfolio, vs. only 0.74 for the unrestricted portfolio. Similar behavior is evident when using the Beta Rank slider to restrict stock selection. Individual investors investing in taxed accounts care about after-tax after-fees performance. The lower the buy and sell operations performed, the lower the transaction fees paid and the lower the tax bills are. Therefore, an investor goal should be the reduction of asset turnover (the percentage of stocks replaced every year). We have designed the Low Turnover Sell Rules with the target of reducing asset turnover in mind. Those rules instruct investors to sort the stocks according to their Cheapness Rank, and sell only the stocks which are not in the 25% cheapest percentile, i.e., have a Cheapness Rank of 25 or above. Let’s compare two portfolios. The first is a VC2-based portfolio with holdings of a $200M market cap or higher, utilizing simple sell rules. Such a portfolio is portfolio #5. It had an Asset Turnover of 81.99%. It means that on average, more than 80% of the stocks are being replaced every year. Now we utilize the Low Turnover Sell Rules, and we sell stocks only if the Cheapness Rank goes above 25. Such a portfolio is portfolio #6. The result is a reduction of the Asset Turnover to a mere 20.41%, meaning that only a fifth of the portfolio holdings is being replaced every year. Naturally, this causes a dramatic decrease in transaction costs and taxes. Although the portfolio returns are lower, 12.38% vs. 15.17% with the simple sell rules, an investor in a taxed account is probably better off using the Lower Turnover Sell Rules. We will now perform an in-depth analysis of the of a Deep Value portfolio, to give investors a better sense of the expected monthly and yearly performance and price behavior. We chose to analyze portfolio #20, which results in the highest risk-adjusted returns as measured by the Sharpe ratio. It is a TEV/EBIT-based portfolio, with 30 stock holdings of a $200M market cap or above, Low Volatility selections (Volatility Rank range of 0 to 50), and employing Low Turnover Sell Rules. This portfolio should be easy to implement and maintain by both individual investors and small money managers. The portfolio has beaten the S&P 500, sometimes by a considerable margin, for most of the years since 1999. However, during 1999, 2007, 2009, 2012,2013, 2017 it lagged the S&P 500. Those periods of under-performance is exactly the reason why Deep Value investing remains a niche. Most money managers cannot withstand such volatility as they would most probably get fired after one year of under-performance. Those investors who understand and accept that a Deep Value portfolio (or any quantitative portfolio for that matter) may underperform by a large margin for periods of 1-year, 2-years or even 3-years, will win in the long run. Over the 19-year period since inception, the Deep Value portfolio has beat the market by a wide margin, about 11% per year on average. It has done so with higher volatility (16.03% vs. 14.37% for the S&P 500), but with a lower max drawdown (which occurred during the 2008-2009 crisis). 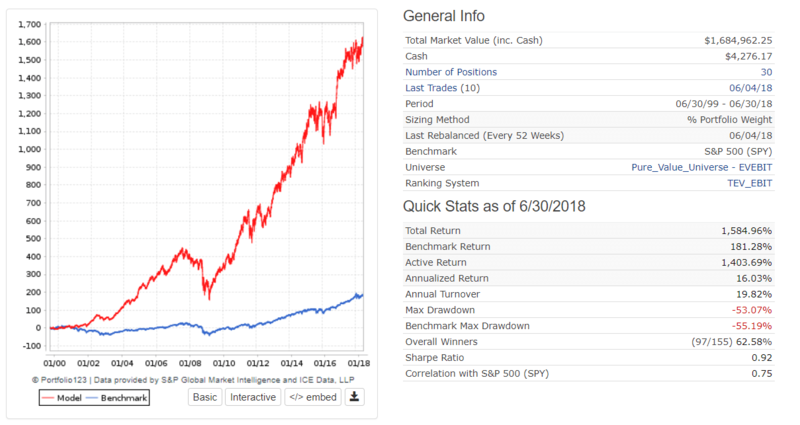 During the last three years, Deep Value had beaten the market by an about 10% total. The Correlation to the S&P500 was around 65% which means that often the portfolio behaved differently than the market. With such a low correlation and higher volatility, holding a Deep Value portfolio requires guts and determination. The y-axis denotes the returns of the Deep Value model (in red) and those of the S&P 500 (in blue) for portfolios that were held for one year which ended on the date indicated by the x-axis. Deep Value portfolios show a continuous monotonic degradation in their outperformance, as measured by 3- year and 5 -year returns and excess Sharpe. It’s getting harder to beat the market, even with a 3-year and 5-year holding periods. Deep Value portfolios still have higher total returns, but with higher volatility. One must take into account that the general market has risen considerably during the last five years, making it difficult for any strategy to beat it. Value investors may face a rare opportunity now to initiate value portfolios that will outperform the market as Deep Value reverts to its historical outperformance trend, or if the market’s stock upward trend dampens. To summarize, Deep Value portfolios beat the market by a large margin. The best risk-adjusted returns were achieved with a TEV/EBIT-based all-cap portfolio allowing holdings as low as a $200M market cap. The volatility of Deep Value portfolio is excessive, higher than the S&P 500 and even higher than Quantitative Value (QV) portfolios. The average annual returns of Deep Value portfolios we’ve tested over a period of 19 years (up to 17.11%) came in a bit lower than QV portfolios (up to 19%). During the last few years, the S&P 500 had performed well, and the rate in which Deep Value has outperformed had decreased. We see some improvement in relative performance since 2016. We believe Deep Value will continue to beat the market over long periods of time. Investors willing to withstand the volatility will win.